Dr. Bridget is passionate about empowering people to live their healthiest, happiest life with the help of chiropractic care, acupuncture and nutrition. Her natural approach to health provides balance in mind, body and spirit. Dr. Bridget suffered from headaches most of her life. Early on, she only knew to take anti-inflammatory medication to help ease the symptoms. She decided to look into Chiropractic on her own, also knowing that she wanted to be in the healthcare field. She soon found out the headaches were coming from her neck and spinal adjusting took them away! She was a believer in Chiropractic from then on. It was from that moment that she knew she wanted to help people through Chiropractic and the holistic approach to health. 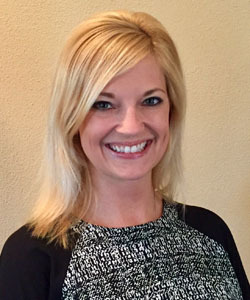 Dr. Bridget earned her undergraduate degree from Southwestern Illinois College. She earned her Bachelor of Science in Human Biology and her Doctor of Chiropractic degree from Logan College of Chiropractic in Chesterfield, MO. Dr. Bridget is also certified in Nutrition and Acupuncture.